Shayln Landrum pulls into third base for Miami Trace during a Frontier Athletic Conference game against Hillsboro Monday, April 9, 2018 at Miami Trace High School. 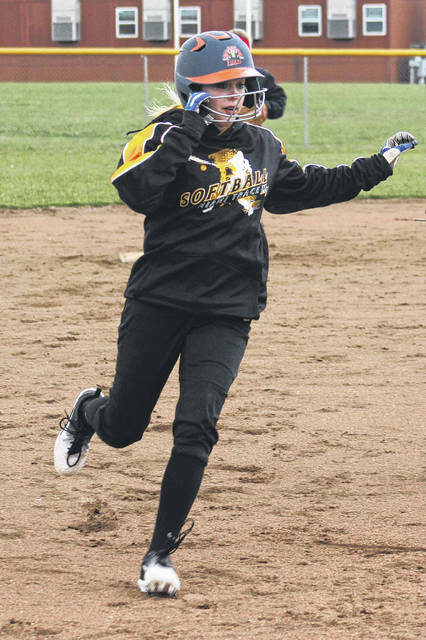 On another unseasonably cold April afternoon, the Miami Trace Lady Panthers varsity softball team hosted the squad from Hillsboro High School for a Frontier Athletic Conference encounter Monday, April 9. Miami Trace won the game, 13-3 in five innings. Madison Mossbarger was the winning pitcher for Miami Trace. Over five innings, Mossbarger allowed nine hits and three runs (all earned) with no walks and two strikeouts. Hillsboro scored two runs in the top of the first. Miami Trace responded with four runs in the bottom of the first. Kaylee Hauck walked and Kylee Rossiter had a bunt single. Jessica Camp hit a triple and Olivia Wolffe singled in pinch-runner Kylee Munro. In the second inning, Hauck singled and scored on a triple by Rossiter. In the third for Miami Trace, Hailey Gilpen and Mossbarger hit singles. Shayln Landrum hit into a fielder’s choice. Taylor Dawson was sent in as a pinch-runner. Dawson steals third and scores on a single by Rossiter. The fourth was another scoring inning for Miami Trace. Wolffe walked and Tabby Landrum hit a single. Krissy Ison singled, scoring Wolffe and Landrum. Mossbarger singled to score Ison. Dawson went in to run for Mossbarger and steals third. Dawson scored on a fielder’s choice by Gracie Greene. In the bottom of the fifth, Rossiter led off with a double and Camp hit her second home run of the season, a long shot over the center field fence. Wolffe walked and Tabby Landrum had another hit. Gilpen hit into a fielder’s choice, scoring Wolffe. Miami Trace is at Jackson Wednesday for another FAC game. The win was the first of the season for Miami Trace, as they improve to 1-3 overall, 1-2 in the FAC. Offensively for Miami Trace: Kaylee Hauck, 1-2, 2 runs, 2 bb; Kylee Rossiter, 4-4, 2 runs, 3 rbi, 1 sb, 1 3b; Jessica Camp, 3-4, 1 run, 3 rbi, 1 3b, 1 home run; Kylee Munro, 0-0, 1 run, 1 sb; Tabby Landrum, 3-4, 1 run; Hailey Gilpen, 1-4; Krissy Ison, 1-3, 1 run, 3 rbi; Taylor Dawson, 0-0, 2 runs, 1 bb, 1 sb; Madison Mossbarger, 2-3; Shalyn Landrum, 0-2; Gracie Greene, 0-1, 1 rbi. On Friday, April 6, Miami Trace visited Greenfield to play the Lady Tigers at Daryl Unger Field at Mitchell Park. McClain rallied with two runs in the sixth and one in the seventh to take a 7-6 win. Miami Trace scored one run in the top of the first. Kaylee Hauck led off with a walk and stole second. Hauck scored on a single by Jessica Camp. For McClain, Beatty hit a single and Smith hit a two-run home run in the bottom of the first. Miami Trace put two more runs on the board in the top of the second. Tabby Landrum hit a single and stole second and third. She scored on a fielder’s choice by Krissy Ison. Hailey Gilpen followed with her first home run as a varsity player. Miami Trace took a 4-2 lead in the top of the third. Hauck singled and stole second and third. Hauck scored on a ground out. McClain made it a 4-3 game with a run in the bottom of the third. In the fourth for the Lady Panthers, Gilpen led off with her second home run of the game. Shalyn Landrum hit a single and stole second. Kylee Rossiter singled to score Landrum. Smith hit her second home run of the game for McClain in the bottom of the fifth. Miami Trace led 6-4 heading into the bottom of the sixth inning. McClain scored twice in the sixth to tie the game and won the game with a run in the bottom of the seventh. Offensively for Miami Trace: Kaylee Hauck, 1-3, 1 bb, 1 run, 1 rbi; Kylee Rossiter, 1-4, 2 rbi, 1 sb; Jessica Camp, 2-4, 1 rbi, Taylor Dawson 0-0, 1 sb; Olivia Wolffe, 0-2, 1 bb; Gracie Greene, 0-0; Tabby Landrum, 1-3, 1 run, 2 sb; Krissy Ison, 0-3, 1 rbi; Hailey Gilpen 3-3, 2 runs, 2 rbi, 2 home runs; Maddie Mossbarger, 0-3; Shalyn Landrum, 1-2, 1 run, 1 sb; Ashley Campbell, 0-1.